Know an expecting or a new mom? Or perhaps you just want to learn about resources for families with kids in Aiken. 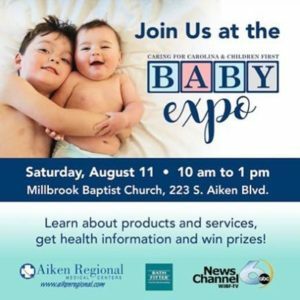 Then come on out to the Baby Expo on Saturday, August 11 at Millbrook Baptist Church. Resonate Creative will be there with information about the Fall Semester of Music Together® for families with kids age newborn to five years old! Enter into the giveaway for a $50 coupon off a semester of Music Together with us! And join in on a quick demo with your little ones! Be sure to RSVP to the Facebook event! And share it with friends! ← Fall Semester Registration Open!